The web server with the IP-address 67.225.150.32 used by Ourfamilyhistory.biz is owned by Star Chapter LLC and is located in Lansing, USA. 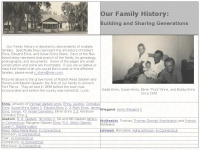 The website Ourfamilyhistory.biz has a own web server. The web server only runs this website. The websites of Ourfamilyhistory.biz are served by a Apache server. The website does not specify details about the inclusion of its content in search engines. For this reason the content will be included by search engines.